Imagine you hit upon what you think is a great idea this morning during the shower. You tell it to your friend over a coffee in the morning or your boss during your hi-hello encounter and you don’t particularly get an encouraging reply. But you are still optimistic. And you say, “OK. Let me check with a few more people”. How long do you think you are likely to stay with it? A week? a month? a year? a decade? 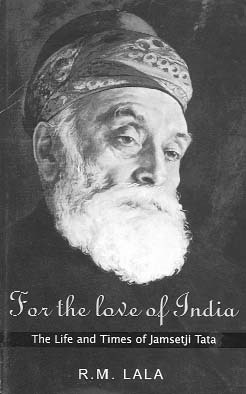 Well, Jamsetji Tata stayed curious with the idea of Steel Plant for 17 years! I call this stamina – curiosity stamina and Jamsetji Tata had tons of it. In fact, it was a hallmark of his method of innovation. Let’s look at three things I find most interesting about Jamsetji’s innovation style. We will start with the curiosity stamina. How did Jamsetji get ideas? By wandering around … not only his factory or city, but the entire world! Jamsetji traveled extensively from Far East in Japan and Australia to west in Europe and US. He visited Japanese silk industry, steel towns in the US, hydroelectric plants of Westinghouse at Niagara Falls and industrial exhibitions at Germany. Everywhere he went, he asked, “Can we use this in India?” Wherever possible, he brought innovations home. He started a silkworm farm in Mysore based on Japanese techniques. He was the first to electrify his home and to equip it with latest in European plumbing. He was also the first Indian to own a gasoline car in 1901. That was 2 years before Ford Motor Company was founded! In an earlier article, I have articulated 3 sources of innovation: pain, wave and waste. If Mahatma Gandhi knew how to feel the “pain” of the masses, Jamsetji had mastered how to surf the next “wave”. There was one thing common between Gandhiji and Jamsetji. It is to think “big” and “far”. Both were great systems thinkers. However, their approaches were diametrically opposite. While Gandhiji approached problems from grass root levels, Jamsetji approached it from the apex. He knew that if he can create a place where Vikram Sarabhai, Homi Bhabha, Satish Dhawan can be groomed, India at large will benefit. That is how IISc was born. So tremendous "curiosity stamina", "constantly surfing the next wave" and "using the apex of the system as a lever" were 3 things I find unique about Jamsetji's method of innovation. Good writing! Keep it up. Here is another curious instance of how the innovation gets fueled by a catalyst. The catalyst responsible for Jamshedji starting steel plant and IISc was Swami Vivekanand, so much so that Jamshedji had requested Swami Vivekanand to be the first head of the Science Institute (IISc). Here I quote from one of the speeches of President Kalam, telling us story behind the birth of IISc. The above link that describes the story and also showcases the letter by Jamshedji to Vivekanand. "At this point let me share the meeting between Swami Vivekananda and Jamshedji Nusserwanji Tata during a ship journey. It happened in 1893. A ship was sailing Japan to USA. There were hundreds of people in that ship including two significant personalities. Swami Vivekananda and Jamshedji Tata were in that ship. Swamiji asked Jamshedji for what mission he was traveling. Jamshedji said that he wanted to bring steel industry to India. Swami Vivekanda blessed him. He suggested steel technology had two components – one is steel science and the other is manufacturing technology. What can you bring to this country in material technology – you will have to build material science within the country. Jamshedji was thinking and thinking and made a decision. ... Jamshedji brought two establishment to this country – first one was steel plant and the other was an educational research institution." Thanks Ravindra for adding the story. Quite inspiring.